With the new Low Pressure Turbo 150, BOGE is setting new standards for continuous energy-efficient supply in the low pressure sector. 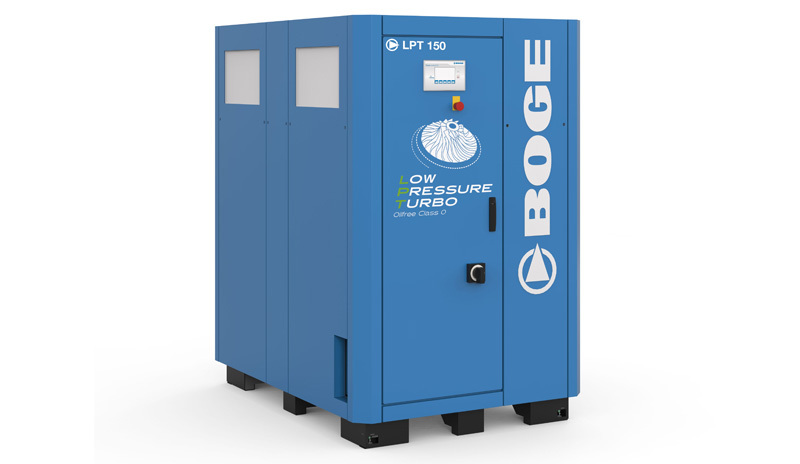 Consistentlyreduced operating costs on the low pressure network – with the new Low Pressure Turbo 150, BOGE promises the best efficiency values at an operating pressure up to 4 bar. In contrast with oil-free screw compressors, low pressure turbo technology stands out due to its excellent characteristics, compact design and quiet running. With 100 per cent oil-free compressed air, the compressor is particularly suitable for sensitive areas of use such as glass production, fish farming and the chemical industry. Combined with the continuous improvement programme service option, the machine remains constantly state-of-the-art. BOGE is thereby setting new standards for ongoing energy-efficient supply in the low pressure sector. Manufacturing glass packaging, operating fish farms and cleaning production lines for metal processing require large amounts of compressed air up to 4 bar. With the Low Pressure Turbo 150, BOGE enables operators of low pressure networks to reduce their running costs. The optimum technical coordination of permanent magnet motor, air-guided drive shaft and two-stage compressor system is setting new standards with regard to efficiency in the low pressure field. A frequency converter adapts the compressor to the compressed air requirement accordingly. The entire drive mechanism works without a single drop of oil. Oil-free class 0 compressed air is therefore produced. The technology is particularly wear-free and low-maintenance – there is no requirement for regular oil and filter changes. With its compact design, the Low Pressure Turbo 150 requires less space than comparable screw compressors. Turbo technology is also considerably quieter than oil-free screw compressors. 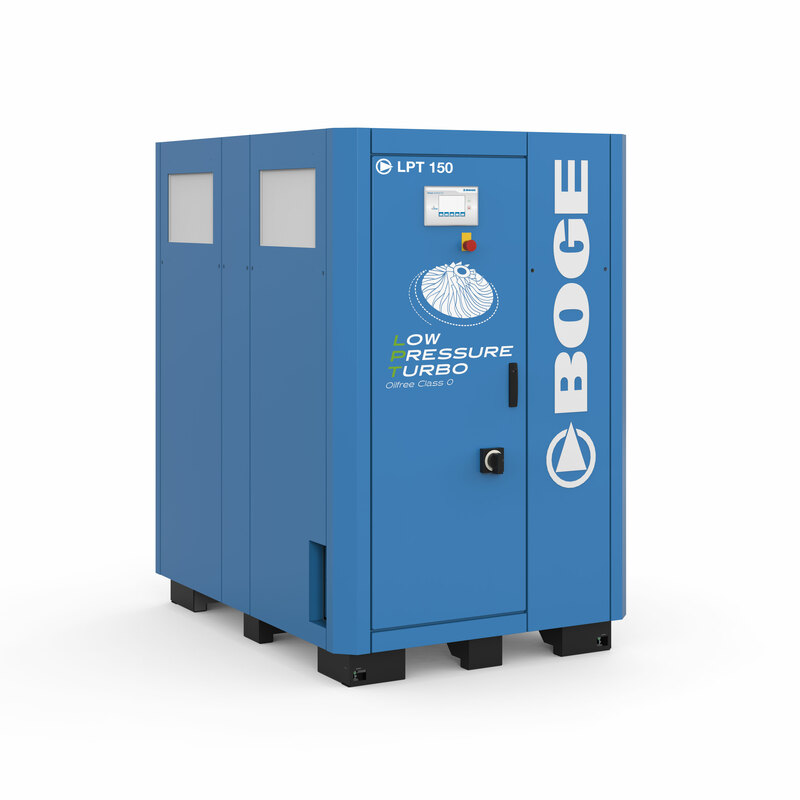 With the BOGE continuous improvement programme (CIP) the compressed air specialist offers users of the Low Pressure Turbo 150 highly efficient production in terms of energy at all times. The family-run company based in Bielefeld analyses the machine data in use by the customer and identifies energy-saving potential. On this basis, BOGE continuously develops turbo technology hardware and software that is functionally relevant individually to the customer. Cost-intensive maintenance thereby becomes a thing of the past – the performance of the Low Pressure Turbo 150 is continuously improved. There is no requirement for investment in product optimisation. The customer and BOGE share the energy savings instead. The result: decreasing operating costs and production that is highly-efficient in terms of energy at all times. As one of Germany’s oldest manufacturers of compressors and compressed air systems, BOGE KOMPRESSOREN Otto Boge GmbH & Co. KG offers more than 100 years’ experience. The company is also one of the market leaders. Whether for High Speed Turbo compressors, screw compressors, piston compressors, scroll compressors, complete systems or individual devices, BOGE meets the most diverse requirements and highest standards, with precision and quality always at the forefront. The family company which operates internationally has a workforce of 850 employees, approximately 490 of whom work at the headquarters in Bielefeld, and is managed by Wolf D. Meier-Scheuven and Thorsten Meier. With its numerous sales offices and subsidiaries, BOGE offers its international customers comprehensive services and supplies its products and systems to more than 120 countries worldwide.